I was lucky enough to receive Delish Gourmet Cupcakes on my birthday this year, and I hope to include them in many subsequent celebrations. Charlotte baker, Aryn Keogh, keeps busy in the kitchen whipping up her coveted treats for everything from corporate lunches to weddings. 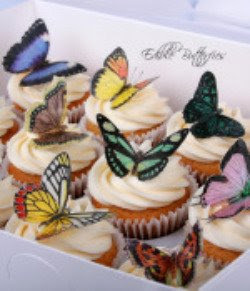 With a range of tantalizing flavors and a flair for artistic flourishes, such as life-like sugar butterflies perched atop frosting, Delish Gourmet Cupcakes are a favorite on the Charlotte scene. The mother daughter team behind these perennially popular confections is as cute as the cupcakes they offer; beyond the out-of-this world taste of their cupcakes, working with them to create a personalized presentation is no doubt what brings back clients time after time. My mom and I could be considered shopaholics! I get my inspiration from looking at clothing patterns, jewelry, and other knick knacks. I also read lots of magazines in order to keep up with current styles. 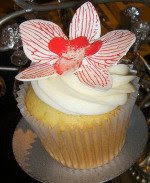 I love designing custom cupcakes stands and decorations for weddings. When you’re not in the kitchen with cupcakes, do you have other favorite things to bake/cook? I can make a mean peanut butter cookie! What has been the most challenging design to execute? Fondant flowers are always tricky to design as making them look realistic is a true art. I LOVE TJMaxx! As for restaurants, Bombay Cuisine (Indian food) has got a really great lunch buffet. I often take a drive out to Latta Plantation for a walk by the lake. A big thank you to Aryn and be sure to visit Delish online, HERE, for lots of yummy eye candy! What amazing cupcakes! The eye candy...We also love the Mother/Daughter business and they are so lucky to get to work together! Thank you for this post and if we get to Charlotte, we will definitely have to try one of their tasty cupcakes! What beautiful cupcakes-very glamorous! My sister in law lives in Charlotte-I will ask her if she knows the bakery! I love the gorgeous decorations. Very artistic. I will definitely have to have you provide for one of my corporate events! New to your blog! I love these cupcakes! How beautiful! I was lucky enough to sample one of these gorgeous cakes at a baby shower I attended last week. I thought they couldn't taste as good as they look but guess what...They do!!! I would recomend anyone in the Charlotte area to get ordering I certainly will be! I'd especially recomend the carrot cake!